Where everything shines as it disappears. 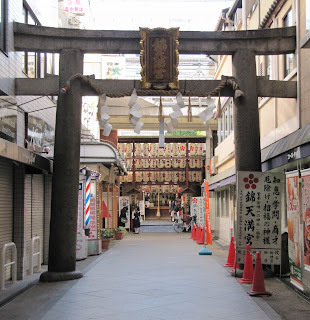 Torii are gateways at the entrance of Shinto shrines, or "jinja". They are typically made of wood, stone or sometimes, iron. 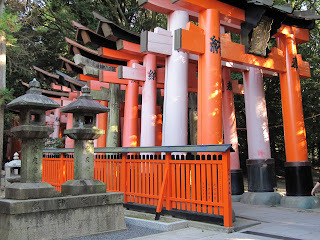 Most wooden torii are painted in red. Torii literally means "where birds reside". It sometimes happens that Buddhist temples have a torii, too. 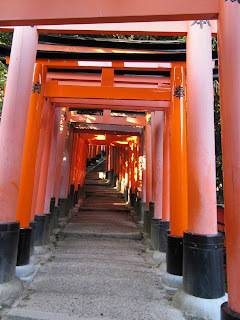 The most amazing place to see torii gates is Kyoto's Fushimi Inari Taisha, where hundreds and hundreds of them are lined up in a tunnel-like fashion. 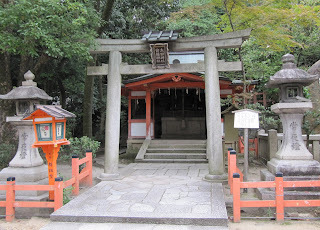 The Inari shrine honors the Kami of rice. There you will also find fox statues as they are the messengers of Inari. 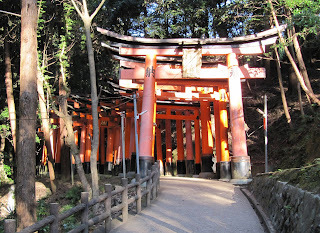 I felt that these torii gates were my first "welcome" to another world. These gates are the division between the physical and spiritual worlds. When I stepped under the gates into the temple grounds, a feeling of renewal come over me. What a beautiful poetic account of your welcome to Japan and Kyoto. I can feel myself slipping into the sacred spiritual space as I read your words, see the images and read the quotes. Welcome home Donna! And Wow! That new header! what a fabulously inspirational and architectonic place.. i bet you have lots of creative ideas after your wonderful visit! It's like entering into a fairy tail, into oneself, into truth, into peace while looking at these entrances. you've communicated your calm joy....a balance. welcome back, my best. Welcome back Donna. You have been sorely missed these passed weeks, as I kept looking to see if there was a post while being in Japan. Your new header reflects your spirit and the sampling of photographs have allowed me to walk in your shadow. It is good to have you back. i have never read a selected Rilke quote that reminded me so so much of Rumi... the same heart, breathing on the same fire. The torii gates are a powerful reminder that it is through transition that we discover the truth about ourselves. It sounds as if you've made your own voyage from "moonlight to dawn". It's looking beautifully Japanese over here! Welcome back! I spend a summer in Japan back in the 70s and have always had a soft spot for all things Japanese. Looking forward to more delightful posts, Donna. Welcome home. Stunning way to introduce us to your journey and to reflect the path you took from the physical to the spiritual worlds on this trip. And that banner!!!! Welcome back Donna. I look forward to seeing how your holiday influences your new art making. Missed your posts while you were gone. We have been lucky enough to go to Japan 4 times as part of an exchange with our town and a rural village in central Japan and I saw your bit on the Tori on India's blog, our next trip overseas will I hope be back to Japan, the most fascinating place in the world. Did you go to Iwa Jima and see the Tori in the sea? Fabulous. Welcome back Donna, I stopped in so many times, looking forward to your return...beautiful post. This is a lovely mixture of photos and poems. Welcome back Donna, first of all, your new header is wonderful and sets the scene for your blog perfectly, I expect to see even more Japanese influence in your work than we have seen in the past. Thank you for showing the photos of the Torii and the information about them, and the poem was perfect. Beautiful photos and nice to hear a little about the trip. 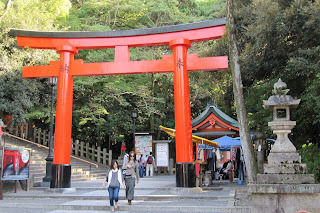 I am only occasionally blogging these days but wanted to stop by and say how happy I am that you made it to Fushimi Inari Shrine...It is really a special place to visit isn't it. I remember a feeling that came over me when we walked along the pathway at the beginning of the Torii, over the little bridge...and I am glad that the Torii have brought you full circle. I love Rilke too, and one of my favorite ideas of his is to vow always to be a beginner. Dear Mr. Donna Watson - No questions you must go too!! Ahhh.....magical - you must have felt as though every cell in your body was illuminated. amazing post! i absolutely LOVE your photos! my siter is going to japan next week -- i should see where she is going because it would be wonderful to send her some of these gorgeous places if she will be close. welcome home! The time must have flown for you but it dragged for us. We missed you! How wonderful are the red Torii gates. The tunnel effect is extraordinary. .... and I love, love your new banner! Thank you everyone for all your wonderful well-wishing comments when I left for Kyoto, and thank you for all your wonderful welcome back comments... I love all my new 'friends' in the blog world. Looks like you had a magical trip...wonderful to see these images and read these words. I enjoyed this immensely Donna! Thanks for sharing your experience and these wonderful images and inspirational thoughts. post script: i appreciate Mr. Donna Watson= would love my husband to embrace that travel concept...he's developed a home-body attitude, and angst about flying. i'm used to traveling on my own, and yes! will continue. looking forward to your future post from your trip. Nice to see a post here, I am sure this trip will have sown many seeds for you and some will bear fruit soon and others over the years to come. How awesome for you to have been able to make all the connections with your heritage! Thankyou for taking me on this magical journey with you. what a wonderful way to welcome us into your journey! welcome back! your presence was missed! ciao! Stunning, such awesome inspiration as always. Your blog truly is a work of art. Bravo on your new header! Your description of the Torii had me thinking stargate as well. What a divine experience, and I love the poem at the end. Marvelous post. Thanks for sharing. Welcome back, Donna! How beautiful are these images and words. I hope your voyage was as rewarding as you had hoped. Traveling can be a disorienting process -- but then that opens one up for these incredible experiences, doesn't it? So beautiful...My son who is 13 was invited to go to Japan with 'People to People'...so nice and exctingto see these poetic images. Welcome home. Thank you for the beautiful photos of your travel Donna!